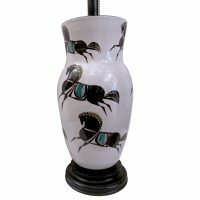 A single late 1940's Italian porcelain table lamp decorated with three rows of galloping horses and ebonized wood base. 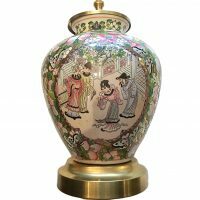 Measurements: Height of body: 20" Diameter: 9"
A circa 1940's Chinese Famille Rose porcelain table lamp, court scence. 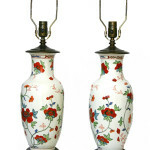 Measurements: Height of body:11" Diameter:8"
Pair of 1950's floral painted Chinese vases mounted as lamps. 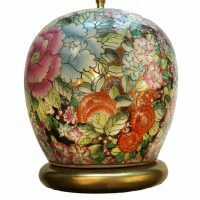 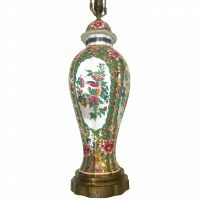 Measurements: Height of body: 18" Height to shade rest: 27.5"
A circa 1950's Chinese porcelain table lamp with floral decoration on a gold background. 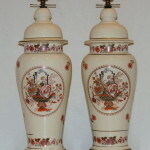 Measurements: Height of body: 11" Diameter: 8"
A single circa 1920's Chinese lidded vase set as table lamp. 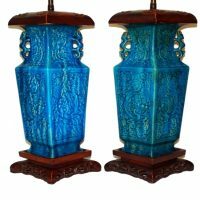 Measurements: Height of body: 22"
Nineteenth century Chinese turquoise-glazed porcelain vases mounted as lamps. 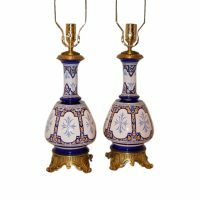 Measurements: Height of body: 17" Width: 7" Depth: 7"
Pair of 1940's Chinese porcelain table lamps with floral decoration and bronze bases. 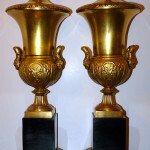 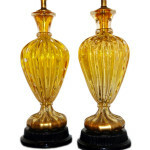 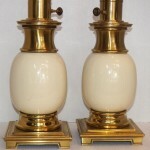 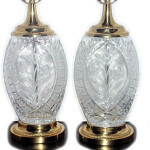 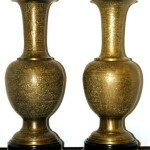 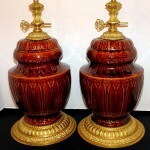 Measurements: Height of body: 18.5"
A Pair of French 1940's molded glass lamps with gilt bronze bases. 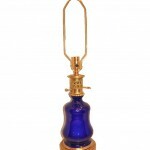 Measurements: Height of Body: 23.25" Height to Shade Rest: 34" Diameter of Base: 8"
France, 1930s A French circa 1930s cobalt blue porcelain lamp. 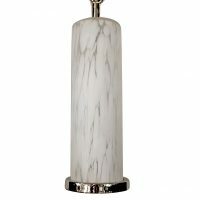 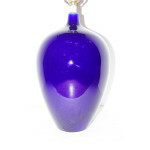 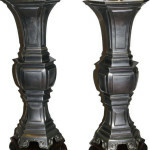 Available at our showroom at 241 East 60th Street, NY, NY. 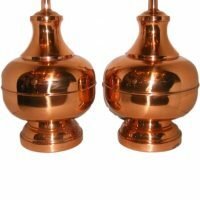 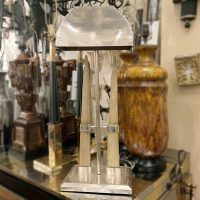 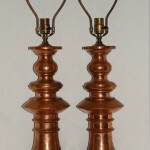 212-751-2282 Price Contact Dealer Condition Excellent Measurements Height of Body: 21.5" Height to Shade Rest: 36"
Pair of 1960's English copper table lamps with polished finish. 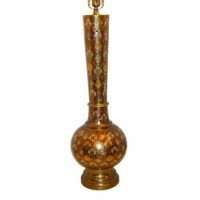 Measurements Height of body: 14"
A circa 1920 Empire style table lamp with painted finish and gilt details, swan shaped handles. 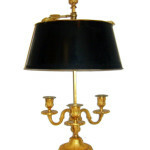 Measurements: Height: 22.5"
A single circa 1920's French cut crystal and gilt bronze table lamp. 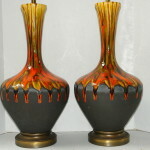 Measurements: Height of Body: 24.5" Height to shade rest: 36"
Pair of French, 1940s cut glass table lamps with gilt bases. 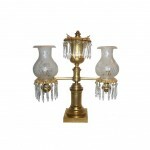 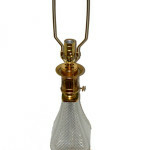 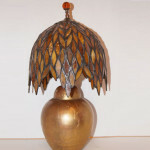 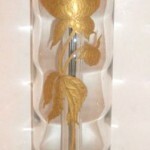 Original patina Measurements: Height of body: 20"
A pair of circa 1960s French cut crystal and gilt bronze table lamp. 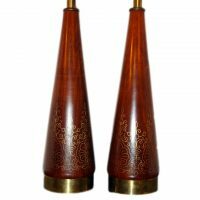 Measurements: Height of Body: 16"
A pair of Danish midcentury hardwood lamps with decorative brass inlay work. 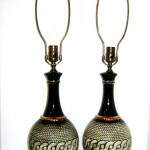 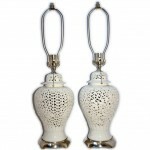 Measurements: Height of Body: 18"
Mid-century dark bronze-glazed porcelain table lamps with a crackled glazed finish. 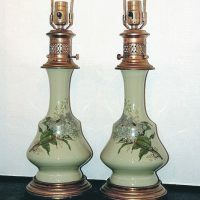 Height of body: 22" Diameter: 6"
Pair of 1940s French neoclassic style lamps with eglomisse decoration on a dark green background. 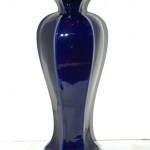 21" height of body. 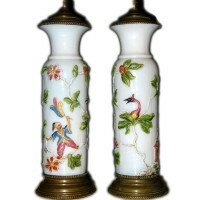 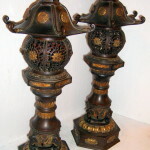 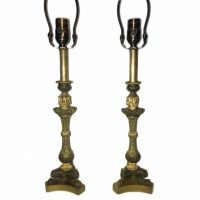 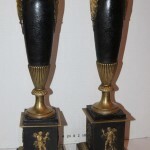 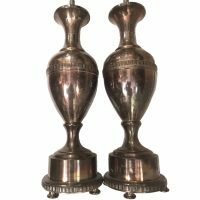 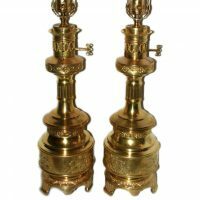 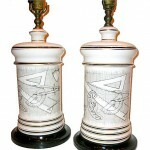 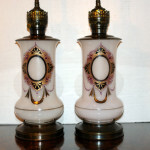 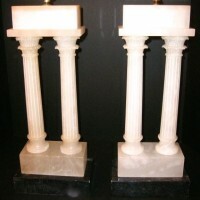 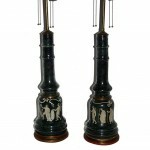 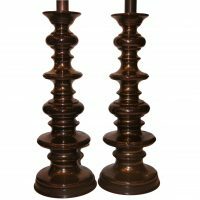 Pair of Empire style late 19th Century candlesticks mounted as lamps, with tripod base, elaborate foliage motif on the body. 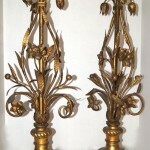 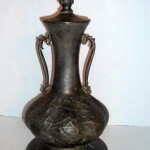 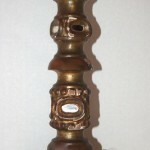 Original gilt and patinated finish. 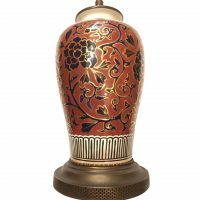 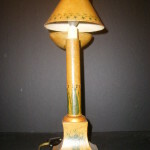 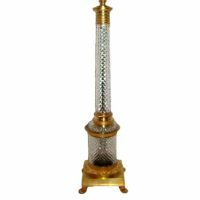 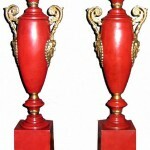 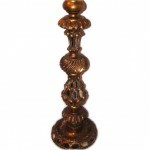 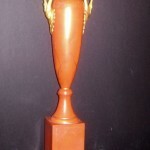 Measurements: Height of body: 12"
A Turn of the Century French Empire style table lamp with painted finish. 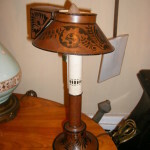 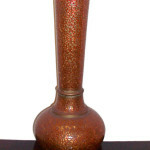 A Turkish, circa 1920's etched brass and enameled table lamp with foliage and flower details. 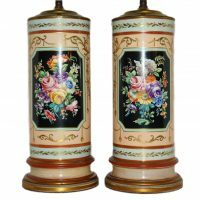 Measurements Height of Body:28" Height to rest of shade: 38"
A pair of circa 1920's French porcelain table lamps with gilt and painted wood bases. 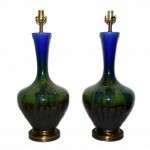 Measurements: Height of body: 16" Diameter: 6.5"
Pair of 1960's French art glass table lamps with lucite bases. 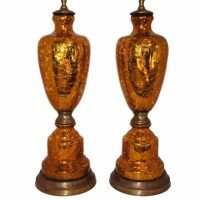 Measurements: Height of Body: 15" Width: 10"
Pair of circa 1900 French Empire style table lamps with painted and gilt finish. 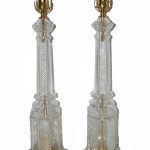 Measurements: Height of body: 19" Height to shade rest: 29"
Pair of French circa 1940's crystal shade lamps with original finish and 2 interior lights each. 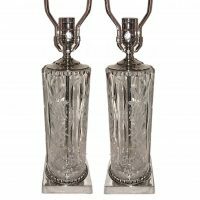 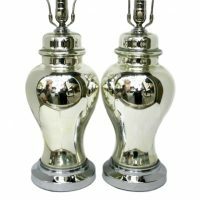 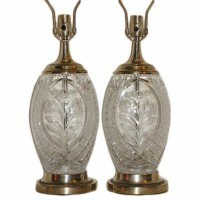 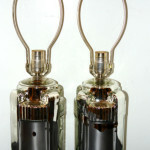 Pair of French circa 1930's mercury glass table lamps with nickel-plated bases. 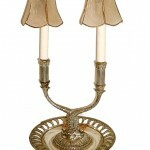 Measurements Height of body: 16.5"
Pair of circa 1900 French porcelain table lamps with gilt bronze bases and hardware. 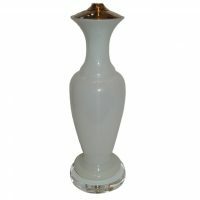 Measurements: Height of body: 15.5" Diameter: 6"
A circa 1940's French opaline glass table lamp with lucite base. 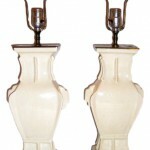 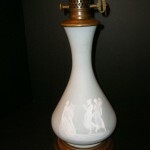 Measurements: Height of body: 19" Diameter: 6.5"
Pair of 1940's French porcelain lamps with leaf pattern on body. 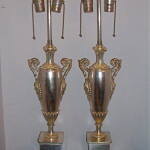 Silver plated hardware. 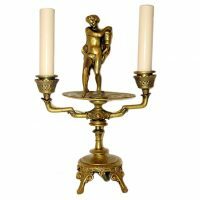 Measurements: Height of Body: 16" Height to Shade Rest: 25.5"
19th Century French neo-classic style gilt bronze bouillotte lamp with painted shade. 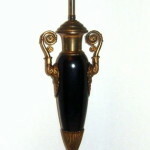 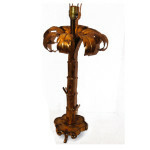 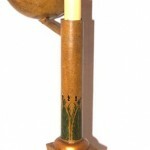 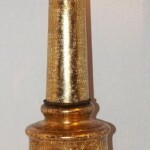 Measurements: Height: 24"
A circa 1920's French gilt bronze ostrich leg candlestick/floor lamp. 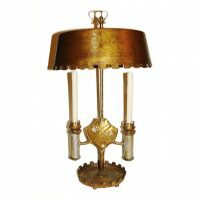 Measurements Height: 33" Diameter: 12"
Circa 1960's Italian Arg Glass table lamp with nickel-plated base. 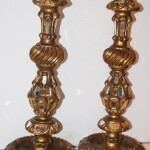 Measurements: Height of Body: 19"
A pair of circa late 1950's Chinese gold crackle glazed porcelain table lamps with dragon motif Measurements: Height of Body: 14" Height to Shade Rest: 24"
Pair of circa 1930's French crackled mercury glass table lamps. 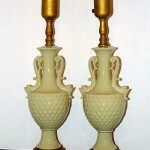 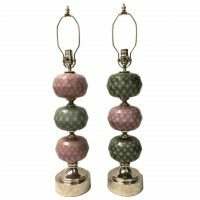 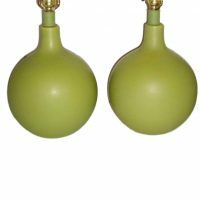 Measurements: Height of body: 21"
Pair of Italian 1960's green ceramic table lamps. 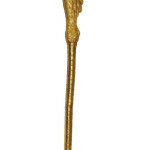 Measurements: Height of body : 13.5"